The updating map function is my favorite! Life saver. That is all. [...] This is probably the most useful app on my phone. 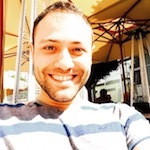 Started in 2011 as a science project at the University of Massachusetts Amherst, this app evolved into an important utility for students. The project was to build an app that fetches bus locations frequently, displaying and updating them on a map, without wasting too much battery. Previously, bus locations were published by UMass Transit, now the data is provided by PVTA (Pioneer Valley Transit Authority). 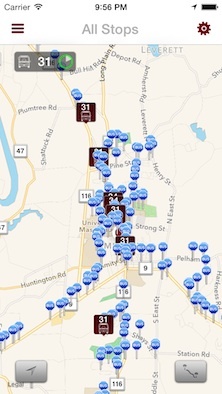 Now, UMass BusTrack is used by thousands of students daily and it helps them catch the bus every day. It provides the complete PVTA schedule, which can be used offline. Furthermore, the real-time bus tracking feature allows users to see where the bus is while waiting at the bus stop. The app is available for iPhone, iPad and, since March 2014, also available for Android Smartphones. 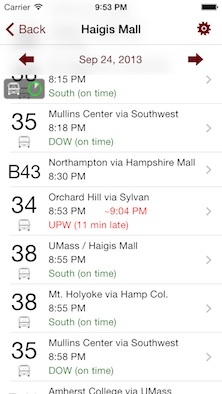 You have a store or business and you would like to reach all UMass BusTrack users? You can now start to advertise your services in the app by sponsoring the development of this app. It is very easy. Try it out now. Simply login if you have an account, or create an account on the members page.